If your home or business has front steps, you’ve likely considered installing an outdoor stair lift. These systems, designed like standard models but built for handling the elements, essentially allow for increased mobility in every condition. The Indy Outdoor, the model offered through our store, mounts directly to the staircase and operates with an aircraft cable drive system to travel at a distance of 16 to 20 feet per minute, at 20 feet per minute. 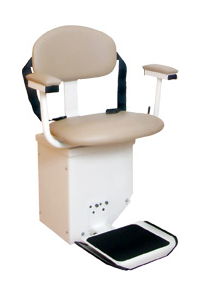 In terms of capabilities, it offers a 19-inch seat that swivels 90 degrees at both ends, supports up to 350 pounds, and folds to just 14 inches, so it doesn’t become an obstruction when not in use. Along with the smooth ride and safety features, it’s outfitted with weather-tight covers, which keep out the elements and protect your system from storms. Within this context, what can an outdoor stair lift do? Don’t wait for a dry, rain-free day to provide access. Rather, because of the protected, weather-tight design, one of these systems allows a homeowner, customer, or clients to ascend the steps in rain, sleet, and snow. Just make sure it’s cleaned off, and whoever’s arriving will have no trouble entering and leaving. It’s not just snow and rain you have to be worried about. Even in warmer, temperate conditions, dirt and debris still blow around and could potentially get caught in your stair lift. If enough accumulates, there’s potential your system couldn’t perform up to par. With the covers in place, the outdoors won’t get to your lift’s functionality. You shouldn’t compromise mobility and accessibility in the face of the elements. In fact, because of the potential slip hazards, equipping your facility or home for everyone becomes paramount. As a result, an outdoor fixture provides just what it should: A smooth ride from one end to the other, sensors to detect an obstruction, and a versatile design suited to a range of body types. Considering an outdoor stair lift? Work with Indy to explore your options for homes and commercial facilities.